If you have a baby, then an important paraphernalia in your home is the steriliser for all of baby’s bottles and other equipment. You are planning your first holiday with baby and perhaps you’ve been wondering about how you will sterilise baby bottles when travelling? So, what are the things that matter most to you about sterilising baby equipment? Convenience - I've got lot of luggage and want the smallest option that ensures baby's bottles are safe. If size matters to you, then we suggest you look at the approaches we've given here. Carry cold water sterilising tablets along with a set of microwaveable/disposable bags in which you can sterilise baby's gear. Milton Sterilising tablets dissolves and sterilise in 15 minutes. Parents have found that the Philips Steriliser bag or the Oasis disposable bags work well with these tablets when travelling. These steriliser bags come with tablets but take 30 minutes to work. Parents have swapped to using Milton Sterilising tablets with these bags to bring it down to 15 minutes. The good thing about these is that they can take multiple bottles at the same time. These bags can be each be used upto 20 times, fit into a standard microwave, so they are handy to have when travelling or at home or even when visiting family. These bags can only fit one bottle at a time. In this you are relying on the steriliser being boiling hot water. 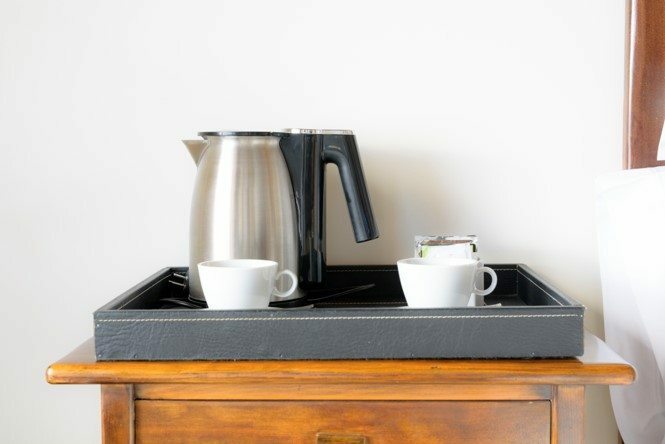 Usually hotel rooms come with a kettle for tea or coffee. Using boiling water from the kettle you sterilise your baby’s gear. First rinse the basin or sink you’ll use with boiling water. Then fill the sink with soapy water and wash all of baby’s equipment. Once you’ve done that and rinsed out the soap, use some more boiling water to sterilise the bottles and whatever else by pouring the boiling hot water over. Make sure you protect yourself and have tongs to pick up the hot items and then air dry on a clean towel. This option certainly has the smallest size of things to carry as well as a bonus. But if this is too much faff about for you, then look at one of the options below. Several baby equipment manufacturers have come up with sterilising baby gear using your home microwave. The only thing to keep in mind is that some of these products require a large microwave to fit their equipment. Even if you have this at home, it may not be possible to expect you’ll have access to the right sized microwave when you travel. This small single bottle steriliser can be used either in a microwave or with sterilisation tablets. This is a handy option for travel to visit family or places you know you will have a standard microwave. When you use the microwave option, you can reduce costs from needing to buy sterilising liquid or tablets. If there is any chance that access to electricity is going to be difficult or unreliable, cold water sterilisers are a dependable option. Cold water sterilisers don’t need to be rinsed out or wiped down. Doing this will undo the sterilisation. Many parents rate this as one of the best sterilisers that’s available. It sterilises in 15 minutes and can keep equipment sterile for 24 hours in the solution. It’s large, so not ideal for travel but there are several parents who do take it on holiday and find it perfect. You’ll need the Milton sterilising tablets or Milton sterilising liquid to create the sterile solution. You aren't comfortable with chemical options for sterilisation of baby gear. When you are doing a road trip and you have plenty of space in the boot of your car, then something you use at home could as well double up for holidays. Here are some of the options you could consider. The sterilisation is done with steam alone, it can keep equipment sterile for 24 hours and can deal with a variety of bottles and other gear at the same time. Parents swear by the anti colic bottles by MAM and this steriliser is loved by parents for its versatility as well. Your baby's safety is vital when you are travelling. By picking the right type of steriliser based on your needs, you can be reassured that this is one aspect of your holiday that is under control.